80 pages, English/Chinese text, illustrations, accompanying VCD showing exercises with minimal English/Chinese narration. A Ba Ji Quan that is not projective is not BJQ. Good shape or bad, the opponent should end up about at least ten feet from you and your principle (BaJi is a bodyguard style). I was in LA recently, outside a club, and I was riveted to the spot watching the doormen prevent a pair of snockered patrons from entering. It was obviously smarter to push these loudmouths than to hit them, but I was impressed with the soft explosion that left each of the inebriated at least ten feeet from the launch point. This book shows a representation of Baji in the Shaolin tradition, gladly with the flavor, structure and usage all intact. Sometimes this cross-breeding of style plus style produces a lesser presentation of BJQ’s power than one might wish for. Here we have a nice, strong and concentrated form. I learned BaJi from Willy Lin at the dawn of time. I remember being taught a version of Da BaJi with pretty much the same punctuation as this one; but, we would pause at every move. At the time I didn’t know what the pauses were for, and it was a long time before I understood some of the power present. A good, powerful rendition, as Baji should be, with a distinct second level of meaning that would add that little, undefined something we all want to see. 88 pages, English/Chinese text, illustrations and accompanying VCD showing exercises also with minimal English/Chinese narration. One of the pillars of Temple practice. Very direct, clear, with barely a fancy movement. Shaolin emphasizes the training method of one movement one step. Not a difficult form to learn and pretty much everyone agrees it is the real stuff. More than most Shaolin forms, this contains what you might accurately call "iconic" representations of Shaolin postures and movements. When you think of it, this leads to an interesting and unexplored question. If a style like Bak Siu Lum, or any other authentic pretender to the throne, is "late Shaolin," and these older, relatively unchanged temple renditions are closer to the original Shaolin, then which version is truer. After all, the newer version would logically be "even more" Shaolin from over 1000 years of practice. Not necessarily an important question since we are comparing apples and apples, but an interesting question, much like the woman visitng Windsor castle who askes, "What a beautiful lawn! How do you get it that way?" "Oh, it's not difficult," says their guide. "All you do is plant the seed, nurture the planting and then roll the lawn for five hundred years." In the huge repertoire of the Shaolin system and its divergent rivulets, Pao Chuan resurfaces again and again. One of a small group of forms that must be considered about as "pure" as anything in Shaolin style; Pao Chuan is about intermediate level, and with a style that is unique and distinguishable. I mention the package for each book in this series because I want to reiterate that this is not a historical, anecdotal or philosophical text. It is raw learning with sepia photos, English/Chinese instructions and a breakdown on theVCD for those intrepids who want a chance of accurately learning a real Shaolin form. Big Hong and Little Hong are two pivotal forms of the Shaolin heritage. Not every Shaolin system offers them but they are widely acknowledged as "official" routines. The movements are so representative of Shaolin history, if not developement, that they are worth the title "iconic." The advantages of this series are good photos, coupled with English/Chinese text, coupled with a teaching VCD. Little history, this is a "hands on" approach. This dual language Chinese/English edition is beautifully designed. This series has an introductory calligraphic introduction by Yang Zhao Ting, the former president of the National Chinese WuShu Association. The writer of the series, Geng Jun, studied under Su Xi, Su Fa and Li Zhuan Yuan. There are general notes and demonstrations of the Shaolin stances for the entire series. There's also a nice short color section on students and Geng Jun's activities. The side-by-side Chinese and English make this a very useful text with clear instructions. THIS BOOK shows the entire Shaolin version of the famous Seven Star Mantis form "Insert Hammer". Form only. See some of the author's VCDs. THIS BOOK is the Shaolin version of yan Qing which is also known as MiZong (Lost Track). The origins of this style are that it was developed at the Shaolin Temple in the Song dynasty by one Lu Jun Yi then further evolved by Yan Qing, his apprentice. Form only. 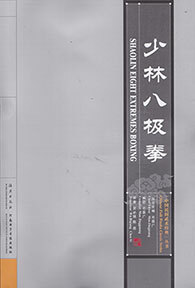 THIS BOOK shows the complete Cannon Fist (anciently known as Cannon Pounding: Pao Chui) form of Shaolin. This strong form is considered one of the "king of Boxing" routines and is a cornerstone of some Shaolin training. Form only. THIS BOOK is the first road of the series said to be created by Su Fu. The inspiration for this series was a number of monks who had left the Temple not fully trained and therefore brought shame to Shaolin. 13 "toll gates" were then created guarded by master monks who would challenge anyone wanting to leave and thereby insure a high standard of skill. Form only. 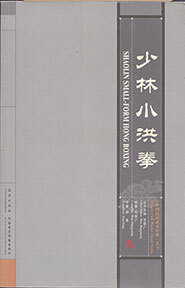 THIS BOOK shows one of the most famous of the contemporarily recognized forms of Shaolin. It contains, among other postures, the famous "sleeping Arhat" pose. Some skill required. Form only. THIS BOOK teaches one of Shaolin's main "small" or "short" fists, the Seven Star. It contains numerous squatting and contracted positions and embodies the Shaolin concept of "defend like a cat, attack like a tiger". Form only. THIS BOOK teaches one of Shaolin's Praying Mantis forms. It is said that after monk, Wang Lang, developed Praying Mantis he returned to the temple for three years and taught his style there. The White Ape series recalls the influence of Monkey Boxing on the Praying Mantis. Where, exactly, Shaolin Mantis lies in the general scene of Praying Mantis if open to discussion but if it exists at all this would be a representative set. Form only. THIS BOOK teaches one of Shaolin's more famous forms. The Plum Blossom design is a five petaled cross. In the old days monks would train on poles six feet in the air moving form one to another planted in this Plum Blossom design. This Kung Fu form has some leaps and light legged stances representing the actions on the balance poles. THIS BOOK shows a famous intermediate form which concentrates on blending hard and soft, firm and graceful movements. THIS BOOK shows a Shaolin version of a core Northern Mantis form. White Ape Presents is practiced in just about all Northern Mantis styles with a strong emphasis on basics mantis skills including some spins. Occasionally this is the next form taught after Beng Bu Quan. The Shaolin Six Harmonies Staff is a partner set. It is performed rapidly but in a relatively small space. One feature of this set, which is a fine beginner’s partner exercise, is that the sections are essentially symmetrical but in a way that you might watch the set for a long time before you realized that each side somewhat mirrors its mate. The actions have a lot of “clacking,” which marks it as a lower level form, but there is considerable use of the back half of the staff for blocking and manipulating which adds a good level of competence in staff work, as does the frequent hand re-positions. A great set for young people and a group of people who can practice with each other in different partner combinations. Book and VCD both having English translations. 70 pages, English/Chinese text, illustrations and accompanying VCD showing exercises also with minimal English/Chinese narration. A medium length Pu Dao set with many turns and a good number of optional jumps. The PuDao is generally played much faster than its cousin the Kuan Dao, or Big Knife. Consequently, there is much turning with the Pu Dao and fast movement that comes quite close to the body. Though rooted in traditional movements, this form has been made a bit “more beautiful” and there is a good portion devoted to rolling the blade and jump-circling. The instructions for the form are in the text but Chinese and English audio points out the main features. A fast weapon that has already placed in a lot of tournaments. This is a whole package unto itself. You have a large text book in English and Chinese, a DVD demonstration with English as well as Chinese narration. There is also an extra half-size photobook of the form in 119 pages and suitable as a quick reminder of the form. A famous two person set from the Temple. This one is basic, but fast and furious, with almost as much arm conditioning as authentic attacking and defending. Each partner’s side encompasses essentially the same movements, but the order varies and gives the set almost the feeling of spontaneity, though it is all really quite specifically choreographed. A fast and interesting performance set with a lot of contact, striking, grappling and kicking. Best for the younger practitioner. Comes with a photos-only booklet showing the pose and moves, sort of a flip-book approach. Very nearly an ugly staff set, obviously not only representative of Shaolin staff but—though not actually mentioned, probably LuoHan branch at that. Though a medium length form there are actually a number of set patterns repeated in both directions with select refrains that would make this a very good set for beginners. The hand positions at the standard 1/3 and 2/3 point on the body make for few hand changes. All the movements are strong and definite and even the softer rolls have authority and purpose. Almost resembles an Okinawa style staff . Good, solid training and more definitely Shaolin than many we have seen. Book and DVD both have English translations. Mao JingGuang. At an early age, before the bones have set, a special training method of the Shaolin Temple can bestow astounding limberness. Core Shaolin training has a number of unusual methods including light body, Qigong, vital point strikes, iron training, and these "virgin boy" exercises. The idea is to make parts of the body as soft as cotton, light as a swallow and strong as iron. It is also considered an aid to longevity. The entire series is shown here and there is a bonus reminder booklet. However nothing can give the full impact but the accompanying VCD. Definitely do not try this at home. Not for the faint of heart.